A new temple was to be constructed over approximately 25 feet of granular man-placed fill soils. The new structure was to be a single-story steel frame building covering approximately 40,000 square feet. Maximum column and strip footing loads were estimated at 50 kips and 6 kips per linear foot. The footings were designed for an allowable bearing pressure of 4 ksf. 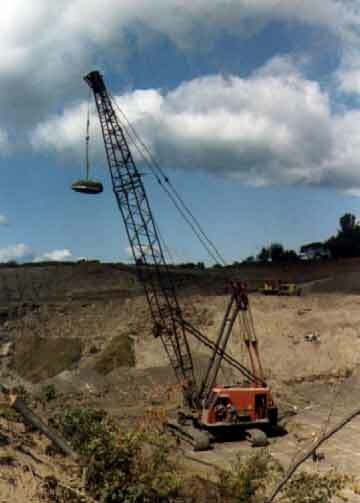 Dynamic compaction was performed with a nine ton weight dropped from heights of approximately 55 feet. Crater depths varied from 3 to 7 feet in the first phase of tamping and 2 to 5 feet in the second phase. The final phase of tamping was performed from 15 feet to compact the near-surface materials. Following completion of the dynamic compaction operations, eight soil test borings were performed. Settlement analyses were then performed at each of the test borings. The standard penetration test values were first converted to equivalent static cone resistances for us to utilize in the Schmertmann settlement technique. The settlement calculations indicated the maximum settlements of the footings would be less than ¼ inch. Vibration measurements were performed throughout the course of the dynamic compaction program. Off-site peak particle velocities were maintained below 0.2 inches per second. No complaints were received from the compaction operations.